Denham began writing to Frye in ’72, seeking his help for his bibliography. In the mid-80s, working on the annotated bibliography, Frye let him have access to his office on the first floor of Massey College at the University of Toronto. It was during this visit when Denham arrived for dinner at the Frye’s with a box full of books to be signed. Denham has no idea how much time he’s invested in Frye. He just replies with a baffled chuckle when asked. There was a time in the ’70s when he quit writing to build a house, be a father and run a letter press. But he would more than make up for any time off after Frye’s death. He was “blown away” when he first discovered Frye’s unpublished writing in the summer of ’92. Transcribing Frye’s handwriting was like learning a new alphabet –Frye never failed to dot an I, and the O always came down below the rule. It would take five years to go through it all. It was slog work, but the daily discovery of something new was impossible to walk away from. Of particular interest to Denham was Frye’s correspondence with his first wife, Helen Kemp. Denham was never hesitant about prying into Frye’s life, alive or dead. Frye was always distant; knowing the line between his personal life and his academic insight was blurry to the point of nonexistence. For all his thorough work with Frye, Denham is still missing certain pieces of the puzzle, such as Frye’s papers from when he was a student at Oxford. Then there are the more than 2,000 of Frye’s annotated books that need to be transcribed. Not to mention the little mysteries. He provides one a vision of what culture can be,”he says.“He realizes we might not get there, nevertheless it has to be held out as a model of what life could be like. A few years ago, Denham thought he had finally said all he had to on Frye, but then he began writing what he calls his ‘Frye and X’ essays. 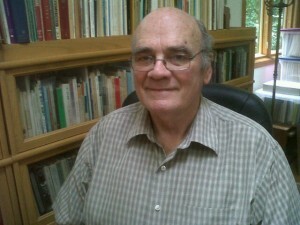 The series uses his extensive bibliographic knowledge of Frye to write about overlooked characters in the Frye lexicon. He’ll deliver his essay on Frye and Longinus at conferences in Toronto and Budapest this year. Just because he’s saying goodbye to his library doesn’t mean he’s saying farewell to Frye. He’s still keeping his annotated series of the Collected Works.